Irish Lilt and Scotch Snap! 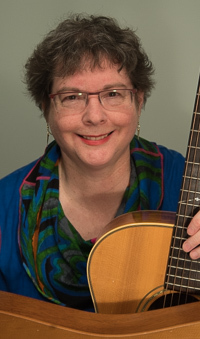 Diane will delight your gathering with songs and stories from the Emerald Isle and the misty mountains of Scotland. She excels at the lilting style of Celtic singing. Her performance brings smiles and laughter, and then brings a tear to the eye with a tender ballad. She also tells some priceless Irish stories direct from the pub. Diane accompanies her singing on guitar or dulcimer, and also does some songs unaccompanied. This challenging style shows off her superb control as she presents timeless melodies with simple grace. There are many opportunities to sing along. For St. Patrick's Day, or anytime of the year, this program will be long remembered for its beauty, wit, passion, and loving embrace of all that life brings. - Londonderry Air, known as Danny Boy, for which Diane has written some compelling new lyrics. - When Irish Eyes Are Smiling and An Irish Lullaby, old charmers perfect for group participation. - Colcannon, in praise of that lovely, buttery potato dish beloved by the Irish young and old. - The Lady Leroy, a ballad that starts in Ireland and winds up in Boston, a most appropriate trajectory. - Eileen Aroon, "Eileen, My Treasure," timeless wisdom from the pen of Irishman Carrol O'Daly in the 14th century. - The Wild Mountain Thyme, a glorious sing-along. - All Through the Night, the classic Welsh lullaby. Wales is considered one of the Celtic lands. - Over the Water to Charlie, professing undying loyalty to Scotland's ill-fated Bonnie Prince Charlie. - Norland Wind, in the voice of a roving Scotsman (are there any other kind?) longing for the hills of home. - Get Up and Bar the Door, a wry tale of a stubborn old Scottish couple who make a bet and nearly do themselves in trying to win. - The Green Plaid, about soldiers who dazzle the lasses as they pass through a Scottish town in the late 1700s. - Rantin' Roarin' Willie and Auld Lang Syne, gems from Robert Burns, Scotland's national poet. - The Parting Glass, claimed by all the Celts, the perfect way to end an evening bidding farewell to friends far and near. Fees vary with travel distance and length of program. Diane is happy to accommodate whatever framework you need.